When I started writing my novel, Come Little Children, I wasn’t sure who had composed the poem with the same title. Turns out, it’s a little complicated. 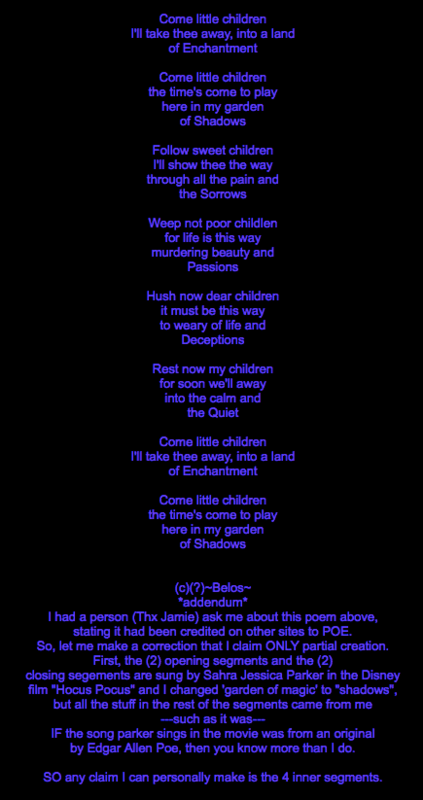 Aside from some capitalization and formatting differences, the most noticeable change is the last word of the first verse: “magic” becomes “shadows”. So what’s the original version? Where did it come from? Was it written for Disney, or is it based on older material that’s now in the public domain? As to extended verses, if you can provide, I’ll vouch for their veracity. If you’ve followed the whole story thus far, you’re probably as surprised as I was. I doubt the licensing company tried very hard to track down the true source, but at least it seems like I’ve got the permission to print based on the original Disney lyrics. Belos’ claim that he/she was the one to change “magic” to “shadows” conflicts with Kate’s claim, but nevertheless, Belos is the first person I’ve seen to take credit for the middle verses. Thank you to everyone who has contacted me about this topic, particularly Callid. I had no idea it would be such a wild goose chase. If you find any more information, don’t hesitate to email me. I’m clearly obsessed with this topic.